Heat oven to 375°F. Spray 13x9-inch glass baking dish with cooking spray. Place salmon fillet, skin side down, in dish. In small bowl, stir together mayonnaise and pesto; spread over salmon. Bake uncovered 30 to 35 minutes or until salmon flakes easily with fork. Let stand 5 minutes. Place on serving platter. Cut into serving pieces. You’ll find prepared pesto, a blend of basil, garlic, olive oil and Parmesan cheese, with the fresh pasta in the refrigerated section of your supermarket. Continue the Italian theme of this dish with a homemade or bagged Caesar salad and Gorgonzola Twice-Baked Potatoes with Bacon. 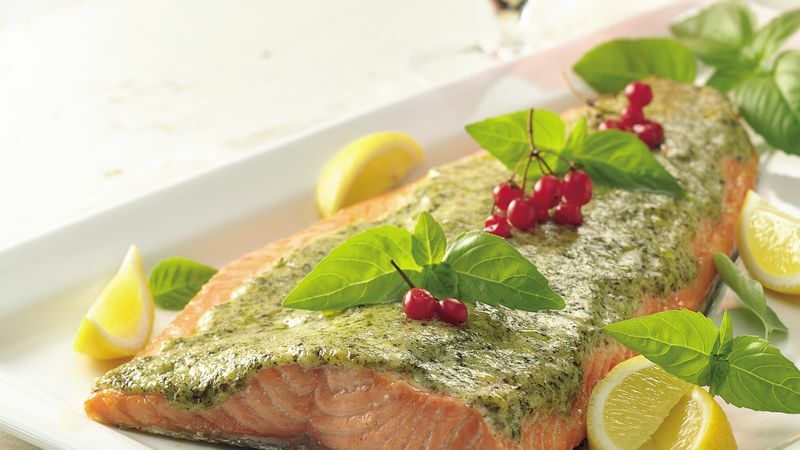 Place the salmon on a serving platter, and garnish with lemon wedges, fresh basil leaves and red currants for a pretty, festive touch.